MOSCOW, August 30. /TASS/. 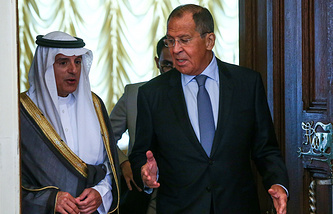 The situation when terrorists are using Syria’s Idlib province as a staging ground for attacks on the positions of Syrian troops and Russia’s Hmeimim air base is unacceptable, Russian Foreign Minister Sergey Lavrov said following talks with his Syrian counterpart Walid Muallem. "It is unacceptable when terrorists who are gathered there, first and foremost, members of the Jabhat al-Nusra terror group [outlawed in Russia - TASS], try to use this de-escalation zone to carry out attacks on the positions of the Syrian Army and target Russia’s Hmeimim air base with drones," Lavrov said. Moscow has sent a clear and strong warning to the West against playing with fire in the Syrian province of Idlib, Lavrov said. "It is no secret that not everyone is happy with progress in resolving the Syrian issue, fighting against terrorism and creating conditions for the return of refugees," Lavrov said. 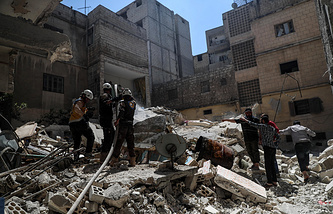 "Attempts are being made to impede these processes and use various provocateurs, including extremists and well-known provocateurs calling themselves the White Helmets, who are famous for staging chemical weapons attacks and blaming them on the Syrian government in order to provide the western countries with an excuse to carry out attacks on Syria," the Russian top diplomat pointed out. "Another provocation is being prepared in order to impede plans to carry out an anti-terrorist operation in Idlib," he said. "Our Defense and Foreign Ministries presented facts to send a clear and strong warning to our western counterparts against playing with fire," Lavrov added. "We call on everyone, including the Arab states, Europe and the US, to pool their efforts to make sure that Syria is a peaceful and stable country, instead of developing unilateral political projects," he went on to say. "Stability in Syria is particularly important for ensuring security and prosperity in the entire Middle East and North Africa," he noted. According to the Russian foreign minister, Moscow and Damascus also agreed to continue coordinating their activities aimed at resolving the situation in Syria. On Wednesday, Lavrov expressed hope that western countries would refrain from impeding plans to conduct an anti-terrorist operation against Jabhat al-Nusra in Idlib. Damascus is making steps to arrange local reconciliation in Idlib Governorate with the paramilitary units, the leaders of which are seeking to break away from the Jabhat al-Nusra terrorist grouping, Lavrov said. "Our Syrian friends shared with us the information on the progress of their efforts to arrange more local reconciliations with the armed units stranded in Idlib and willing to break away from Jabhat al-Nusra, as well as on the efforts to ensure civilians’ security in that zone of de-escalation," he said.